Yangon International Airport (sometimes call Yangon Mingaladon Airport) has two terminals, international and domestic. There is a shuttle bus that runs between the terminals with a 20 minute frequency and both terminals have Visa- and Mastercard-ready ATMs and pre-pay mobile SIM cards sales counters. Domestic schedules can be found in the tables below, and you can book these flights online on this website (click on button below the tables). Details of international routes from Myanmar can be found here. A taxi from downtown Yangon to the airport should cost K7000 – haggling will often be necessary. There are air-conditioned red and white airport shuttle buses that run to the international terminal every 20-30 minutes from Yangon Central Railway Station and Sule Pagoda, in the centre of downtown. The service operates from 4am to 10pm and a single fare is K500. A taxi from Aung Mingalar Bus Station takes approximately 30 minutes and costs K3000. Both of Yangon’s main bus terminals are situated a long way from the centre of town – sometimes taking an hour and a half by taxi if the traffic is bad (cost is around K8000). Public transport options are difficult for foreigners as local buses are very slow and they are in Burmese language only. Note that bus services to Ngwe Saung are reduced during the rainy season from June to October. Buses serving most destinations around Myanmar depart from Aung Mingalar Bus Terminal (sometimes known as Highway Bus Station); a taxi from downtown Yangon costs K8000 and takes one hour to an hour and half, depending on traffic. A taxi to Yangon International Airport takes approximately 30 minutes and costs K3000. There are ATM facilities at the main bus arrivals point. Buses to Chaung Tha beach, Ngwe Saung beach, Pathein, and other destinations in the Irrawaddy Delta region depart from Hlaing Thar Yar Bus Terminal (also know as Dagon Ayar or Highway bus terminal), across the Bayintnaung Bridge (K8000 taxi from downtown, one hour to an hour and half journey time). Minibuses to Bago depart from Saw Bwar Gyi Gone bus station, near the airport (there are buses every day throughout the day to Bago, tickets cost K2000). 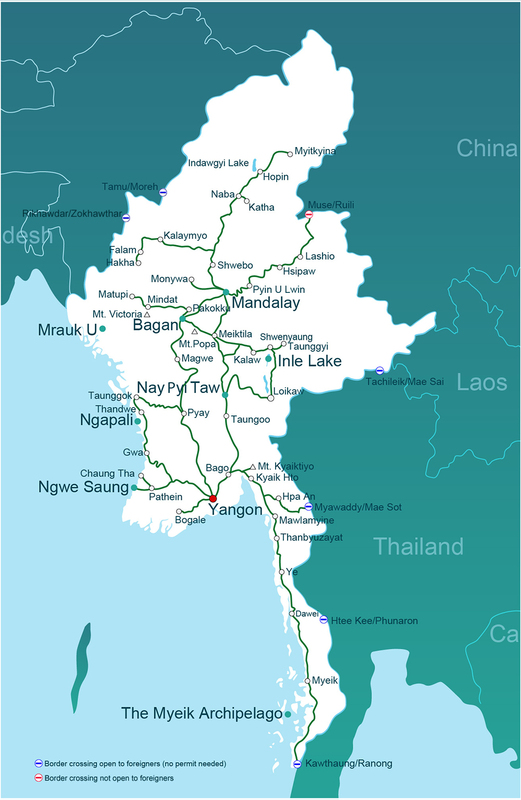 ​To find out more about bus travel, go to getting around Myanmar by bus. You can book tickets online in advance below. Alternatively, the Myanmar Railways booking office is on Bogyoke Aung San Road, opposite the Sakura Tower (the tallest building in downtown Yangon); this is on the opposite (south) side of the railway tracks from the main station building. If you are buying a ticket on your day of travel, you should do this in the railway station itself. You can get to various points in the Irrawaddy Delta by boat, including Pathein and Bogale; boats arrive and leave from different jetties along the downtown river front depending on your destination. Taking the boat makes for an interesting journey, but it is much slower than taking the bus.